Heidenreich, C.e.. "Louis-Joseph Gaultier de La Vérendrye". The Canadian Encyclopedia, 26 April 2018, Historica Canada. https://www.thecanadianencyclopedia.ca/en/article/louis-joseph-gaultier-de-la-verendrye. Accessed 19 April 2019. In the east, he participated in the Mohawk campaign (1748) and on Lk Champlain (1759) during the SEVEN YEARS' WAR. The most active and gifted of the 4 La Vérendrye sons, Louis-Joseph died in a shipwreck off Cape Breton. Louis-Joseph Gaultier de La Vérendrye, "Chevalier," explorer, fur trader, military officer (b at Île aux Vaches, New France 9 Nov 1717; d at sea 15 Nov 1761). Youngest son of Pierre Gaultier de Varennes et de La Vérendrye, Louis-Joseph is best known for having led the first European exploration across the Missouri R into the Great Plains. He joined his father's westward explorations in 1735 and helped him re-establish Ft Maurepas (1736) and build Ft La Reine (1738). In 1738 he accompanied his father to the Mandan country (near Bismarck, N Dakota) and in 1739 was sent N to explore Lk Winnipeg. 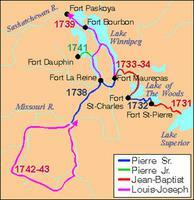 It is likely that he reached The Pas on the lower Saskatchewan R. In 1742 Louis-Joseph, his brother François Gaultier Du Tremblay and 2 other Frenchmen undertook their epic 15-month journey SW of the Mandan in search of the fabled "western sea." Having reached what were probably the Big Horn Mtns (Wyoming) they returned along the Cheyenne and Bad rivers, and buried a lead plaque at Pierre (S Dakota), unearthed in 1913. After 1743 Louis-Joseph served as post commander at Chequamegon, Kaministiquia and Michipicoton.